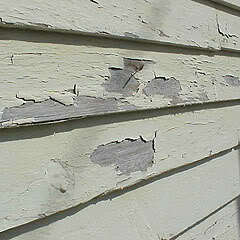 Peeling paint is just one of the most easily recognized signs of a sick home. Homeowners often get frustrated with a recurring paint problem and call on a contractor to install an expensive vinyl siding job. Unfortunately, this will only make a bad situation worse. The newly sided home now really does have a plastic bag wrapped around its neck, and it will die even faster. New siding, Tyvek wrap and insulation board are not the problem per se, but they can mask the fact that major problems still exist but are going on unnoticed. What little air-flow may have been occurring through old cracks and crevices has now been completely sealed off by the installation of new siding. Now you really have an unhealthy home prone to accelerated mold growth, a buildup of interior pollutants and higher utility bills due to inefficient heating and air conditioning. Is your home sick? Just as a suffocating person can be saved by adding oxygen, so a dying home can recover by adding air flow. Roofing professionals, shingle manufacturers and DIY-gurus all stress the importance of proper roof and attic ventilation. Roof and attic ventilation extend the life expectancy of shingle roofs, decrease the chances for the formation of ice dams and excessive utility consumption. Homes must breathe. How do professional roofers help a home to breathe? By installing a balanced ventilation system at the soffit (overhang) areas of a home, which allows air to come into a home and flow upward through the attic area. Also, installing functional outlet vents at the peak or gable ends of a home allows bad air to exit the home, venting excessive heat in the summer and humidity in the winter. The good news for the old home that the realtor called about was that Roof Time installed a new, properly balanced ventilation system for less than one-third the cost of new vinyl siding, and the home was saved. Have your home professionally inspected by Roof Time and receive a free copy of a DVD or CD Rom that completely demonstrates the keys to proper roof ventilation. Call Roof Time in Cincinnati at 513-753-TIME, or in Northern Kentucky at 859-344-TIME to schedule an inspection.